Along with International Surfing Association President Fernando Aguerre, Casper showed the gathered Olympic dignitaries what stand up paddling actually is with a brief but enthusiastic demonstration during the SportAccord convention. Granted it was held in a luxury hotel pool, which is a long way from the Ka’iwi Channel or the beach at Dana Point, but I’m sure the novelty value alone would have made everyone in attendance stop and take notice. And no doubt that was the main point of the whole exercise: Spread some basic awareness to those in power. In front of key Olympic family members, the International Surfing Association [ISA] today hosted a special live demonstration of StandUp Paddle [SUP], one of the sport’s most popular and fastest growing disciplines. 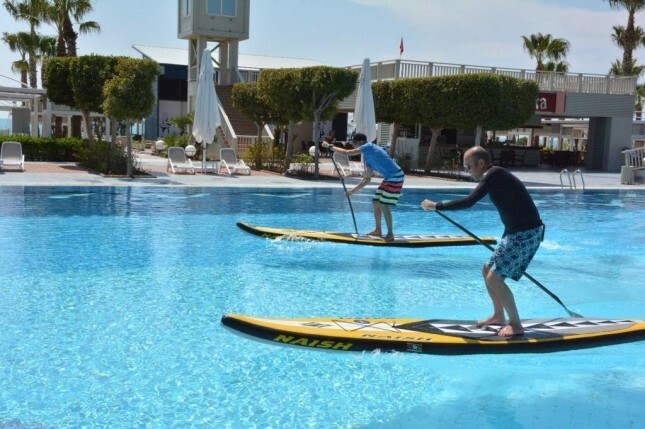 As part of the world governing body’s plan to step up its aim for inclusion in the Olympic Games Sports Programme, the demonstration was carried out by Denmark’s 2013 ISA World SUP Racing Champion, Casper Steinfath. ISA President, Fernando Aguerre, was also present. We didn’t really learn a whole lot else that we didn’t already know: Most of the good stuff at these conventions happens behind closed doors anyway, where uber-networkers such as President Aguerre do their lobbying work and try to build support from those with voting power. But as far as public displays of enthusiasm go, I think it’s a small but symbolic win for the stand up paddling world. Sure, the Olympics are a long, loooong way away for a sport as young as SUP, while some paddlers would argue stand up shouldn’t even be chasing the Olympics at all. But for those who would love to see SUP racing in the Games one day, you can rest assured the ISA is going out of their way to try and make it happen. So while this one event alone won’t get SUP accepted into the Olympics, it is one more important piece of the puzzle. And either way: We got to see Casper wearing a suit, so there was that as well. Anyone else get the feeling the young Danish Viking is fast becoming one of the top ambassadors this sport has?